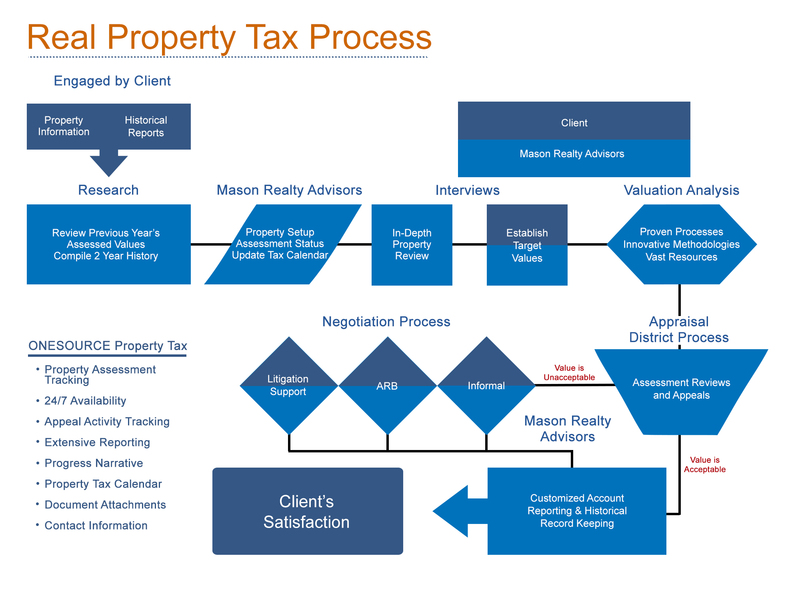 Mason Realty Advisors is a full-service property tax consulting firm with a proven track record of saving clients’ money. We provide strategies and solutions to effectively minimize the costly burden of property taxes on commercial real estate, multifamily properties and business personal property. The hallmark of our client service philosophy is listening to our clients’ expectations, assessing their needs, and responding with results. Our team works closely with each individual client to implement a property tax management strategy that fits their specific needs. Our client service professionals have the background and training necessary to expedite a resolution in the areas of assessment review and reconciliations, valuation, and appeal administration. Mason Realty Advisors is dedicated to providing high quality service, maximizing results, and forming long-term relationships with our clients. Our dedication to independence, objectivity, and technical excellence is the foundation of our firm. Tom has over thirty years of experience representing multifamily, commercial real estate property owners on a national and local basis in commercial real estate valuation and ad valorem property tax matters. His property type specialties include apartments, industrial, office and retail, health care, and special purpose improvements (corporate headquarter campuses, heavy manufacturing plants ranging in size from 2 to 12 million square feet, automobile dealerships, and nursing/retirement homes), and commercial business personal property. Tom has began his career in property tax at Deloitte, a Big Four accounting and consulting firm, in their commercial real estate valuation and dispute consulting practices and later transferred into their property tax division. Tom was previously a national director of property tax in the Dallas office of Ryan, LLC, the largest tax services company in the U.S., where he oversaw real estate appeals in Texas (Dallas, Tarrant, and Collin counties) and personally handled the appeals and value settlement negotiations on over $3 billion in assessed value annually with annual tax savings averaging in excess of $2 million. May 15 – Last day (or as soon as possible after this date) for Chief Appraiser to mail notices of appraised value and notices of denial of exemptions.